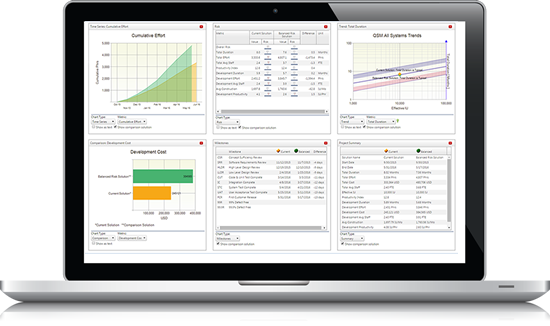 QSM provides estimation and business analytics to manage your software portfolio investments. Get the inside scoop on the industry’s best tools & services. Explore custom-built solutions for the public sector. As pioneers in the software estimation field since 1978, Quantitative Software Management is more than a company name; it's the philosophy that defines our mission—providing business analytics that enable superior business decisions, saving millions of dollars, and allowing our clients to meet schedule, budget, and quality requirements. QSM offers a variety of solutions, from tools to consulting, targeted to many IT-heavy industries. 7 of the top 10 global system integrators use QSM tools and services for complex system measurement. Our tools and services provide precise, responsive data to make intelligent decisions and foster IT excellence. Our DoD clients leverage our estimation and oversight experience to manage and plan complex programs. QSM supports IT governance and provides business intelligence for commercial clients. Our tools and services manage reliability, while reducing risk and time to market. We help evaluate, track and benchmark vendor bids, while controlling costs on IT projects.